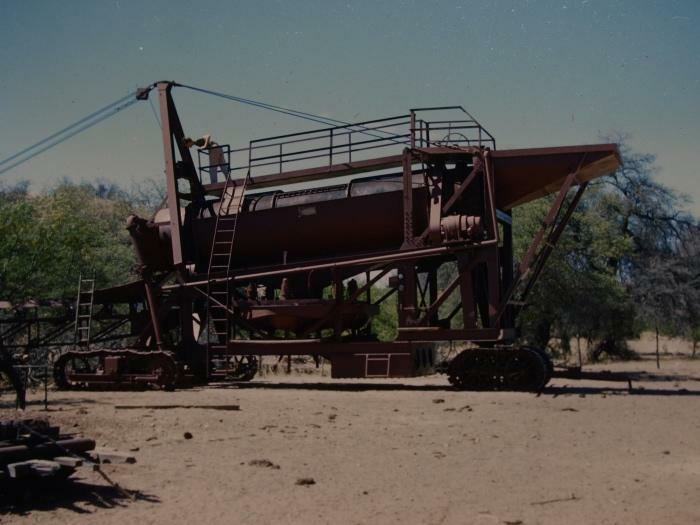 I wonder how you would set up it up to dredge for ores of nobium, uranium﻿﻿ and tantalum. Those ores aren't particularly heavy compared to gold. Seems you'd have modify the process in order to capture those ores as opposed to gold. Nobium is not that heavy, but tantalum and uranium are both pretty heavy, both much heaiver than lead and it can be caught pretty easy in a dredge, tantalum's specfic gravity is around 16.6, uranium is around 18.7, most anything with a specfic gravity of over 10 or 11 can be caught in a dredge pretty easy. While the metallic forms are heavy, I can't imagine those ores also being heavy. 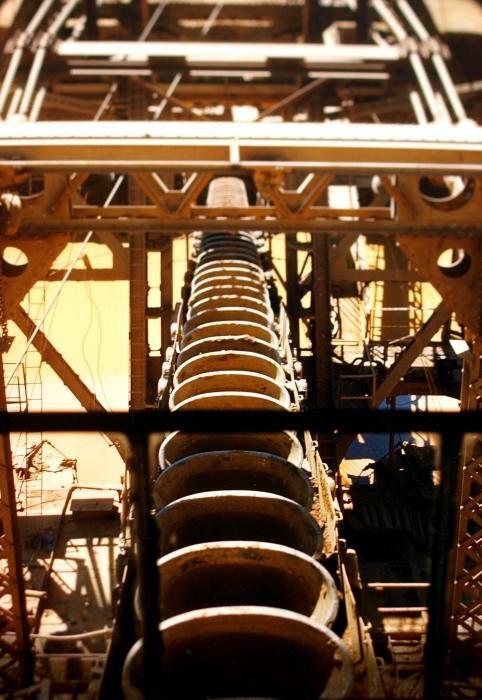 It just seems you wouldn't be able to run the dredge the exact same way for the ores as you would for gold. I agree there would have to be some modifications, water flow, riffle type, etc., but most blacksands caught in dredges easily only have a specific gravity of 5 to 6 as in the case of magnetite and hematite, and most all of these rare-earth minerals ore would be in the form around the size of sand, I'm sure not much of it was in big chucks, even when these dredges were dredging gold the material going through the sluices was screened down to no bigger than 3/4" to 1" and sometimes smaller depending on the gold being recovered. Morlock, now you have me wondering how diamond dredges manage to separate relatively lightweight diamonds from heavier mud. Maybe they're designed to catch the lightweight diamonds that wash over the top, and allow the heavy gunk out the bottom? I'd never thought of that before, how to intentionally recover lighter target minerals. Diamonds, sapphires and many other precious stone or caught on a "greased" slick plate/table in which they readily stick to, diamond, etc. are hydrophobic, meaning they resist being wetted, and as such stick to a greased surface easily. Aha! That explains it. Thanks. Perhaps a trommel? If it is a trommel, though, I can't understand the reason for the huge Pitman arm. Whatever it is, the axle/I-beam cross member that supports the track appears to be a temporary affair scabbed together just to get the contraption from one site to another. It must have been towed by a Cat or winch. The upper section is definitely a type of trommel, you can see the barrel shape of it at the top and also a drive motor at the right rear. Here are a few pics of a different dredge. This one is the Natoma #6. 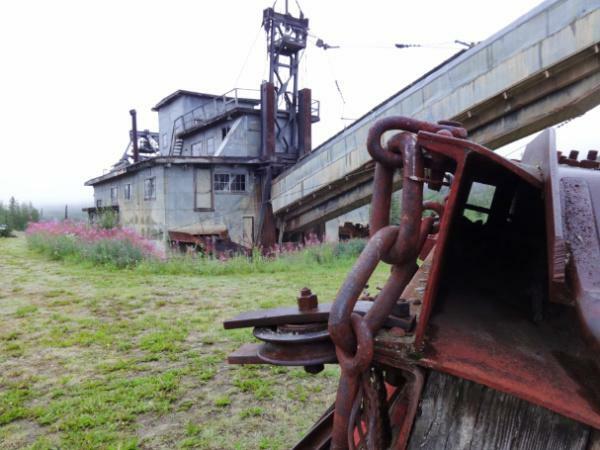 Another article I read about it said that it was the last working dredge in California. 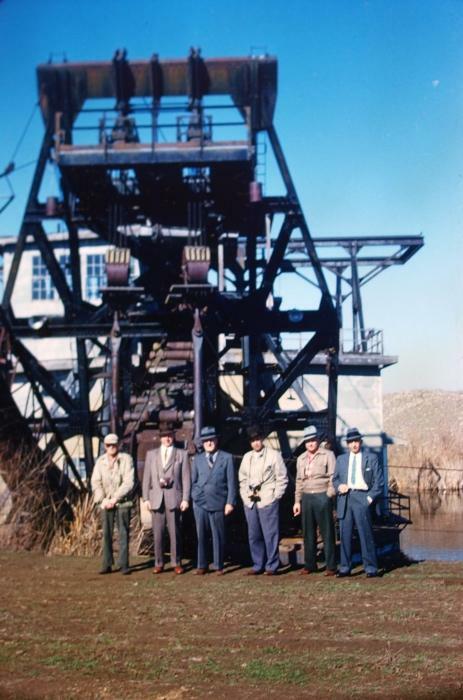 Operated near Folsom, CA through 1962. These pics were taken July, 1959. I wonder if this is similar to the dry land dredge that operated in the San Domingo Area? 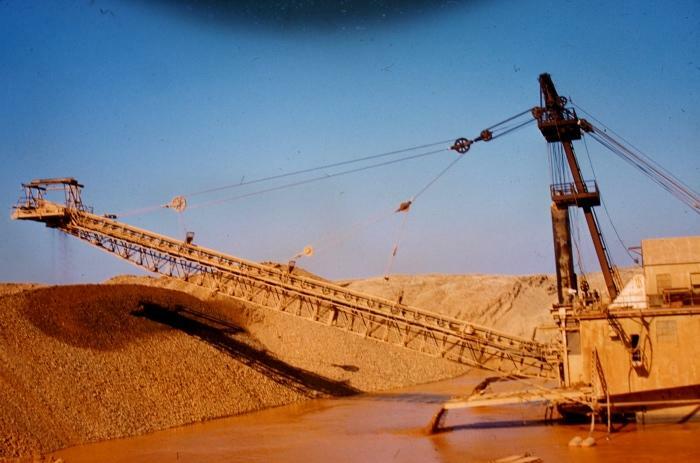 Never seen a picture of a dry land dredge. Google does not have one. There's Dry Blowers, but not a propelled drege. Great photos, sets the mind to wandering..... Thanks. Here is my trommel plate from the dredge in Snelling, CA. 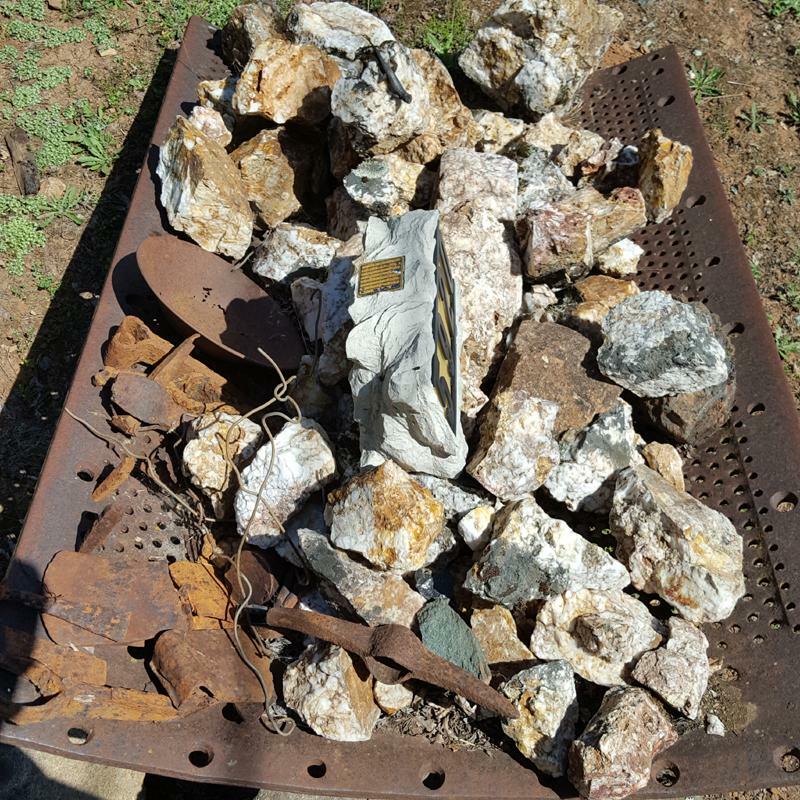 I have it set up for some ore, rocks and items found around our claim. Some interesting chisels are in the collection. 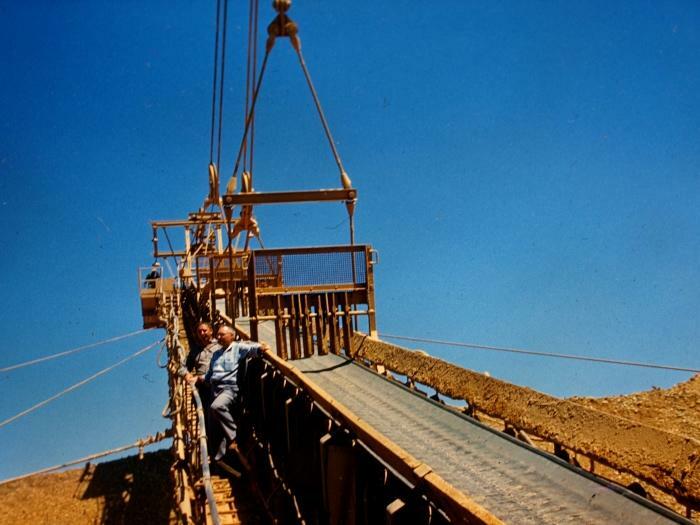 The dredge used in San Domingo was the Geraldine dryland dredge manufactured by Yuba Industries and delivered in 1961. 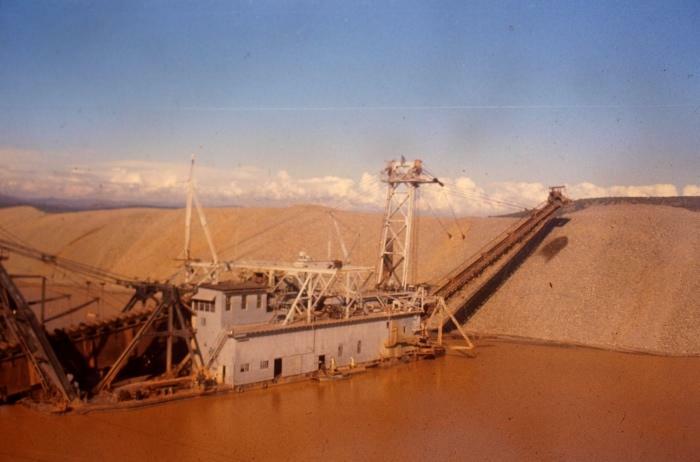 She was named after the owner of United Placers Industries, the company who ordered the dredge from Yuba Industries. The Geraldine was also used on the lower LSD west of the highway after mining on the upper LSD. There is some evidence she might have been used on the Hanson placer (still being mined) and Malibu placer both just east of Hwy 60. 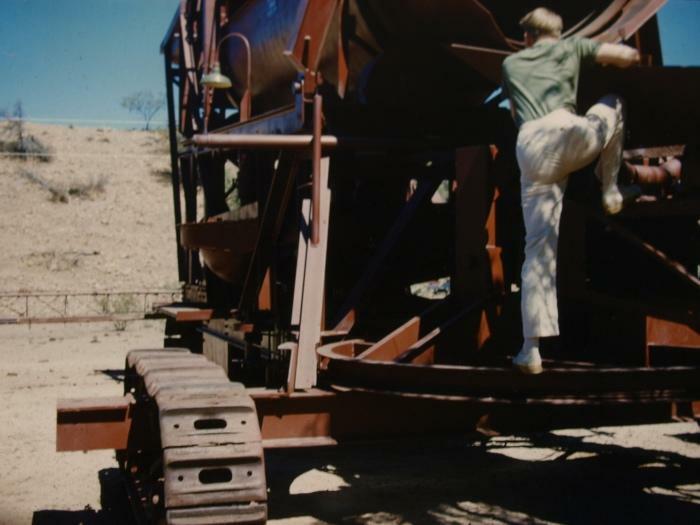 The Geraldine was much bigger than the processing equipment shown in that picture. The picture doesn't show the actual dredge. If you have ever been on the lower LSD those 40 foot cliffs along the wash were a result of the Geraldine dredging. Obviously not something the pictured machine could have mined or processed. The Geraldine was BIG. 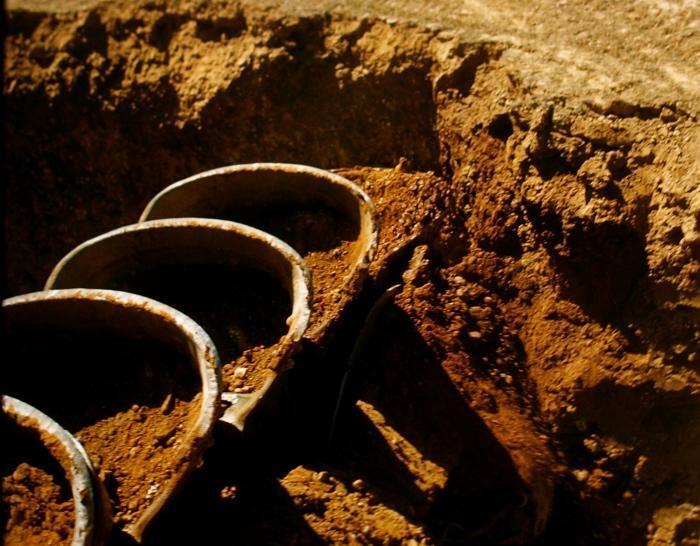 Yuba industries is still manufacturing and rebuilding dredges when needed. Dredge 21 out of Marysville is retired now but Yuba Industries rebuilt Dredge 17 and is still actively dredging in California. About 7000 yards a day. 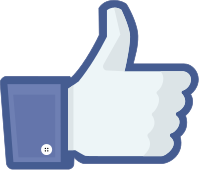 They use it to test new mining equipment designs. 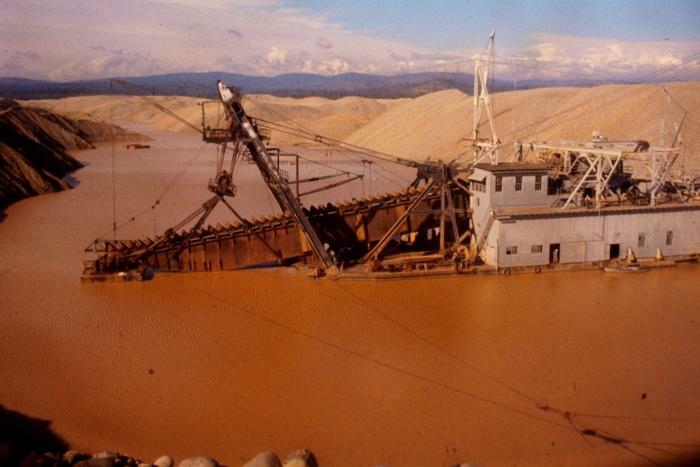 I don't think there has been any point in California mining history when a dredge hasn't been operating on the major rivers since they were invented. 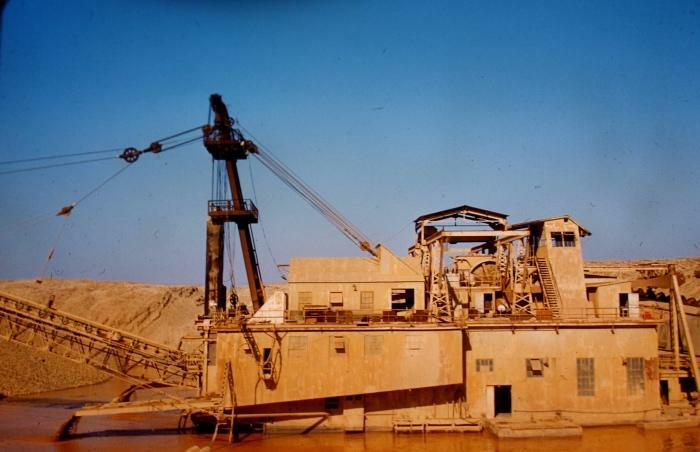 Yuba Industries was the world leader in large dredge design and construction for nearly 100 years. 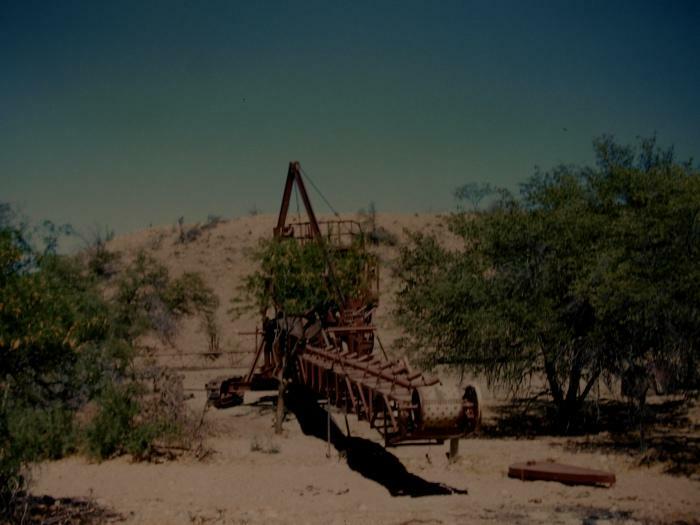 The older dryland dragline dredges were moved either by powered or passive tracks. 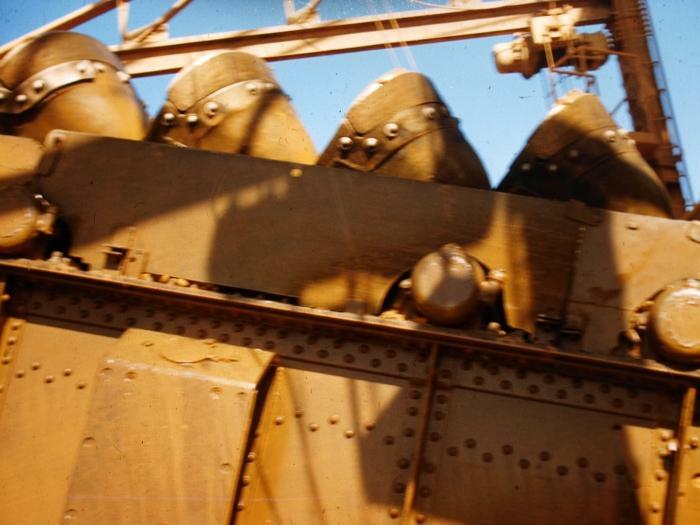 Newer dryland dredges are the "walking" design and and the "feet" are retracted while the dredge is mining. Thanks for that info Clay, I didn't have any details on that piece aside from what I already mentioned. Here's a few more... I like the old Willy's pickup in the background of the last pic. Clay I worked for a private"sand and gravel" plant that provided sand for the Az. C.A.P. project. a lot of the work was contracted out. I was operating heavy equipment for them feeding the plant or loading trucks. It was very successful operation but a lot of hard work getting permits and picking up and moving the whole plant from wash to wash as the project progressed toward phoenix. It was a pretty smooth operation except for those pesky nuggets that kept clogging up our power screens. just kidding about the nuggets, but there was a lot of byproduct in that sand and gravel. 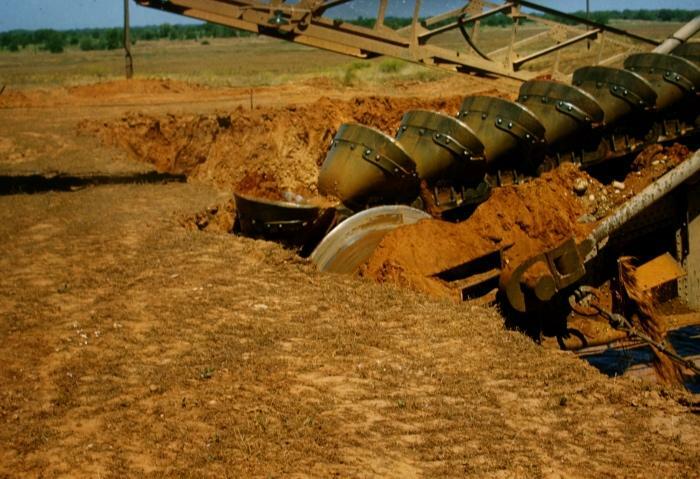 Im not saying the plant would be profitable as a stand alone operation for byproduct only but the sale of the sand and gravel more than covered the cost of the whole operation and we were loading trucks as fast as we could crank out the processed sand. 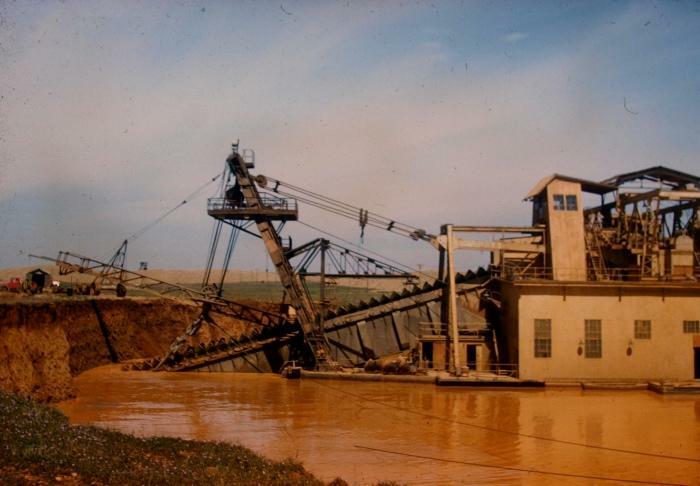 "The Yuba #21 gold dredge sunk in the Yuba Goldfields of northern California in late January.The dredge is owned by Cal Sierra Development and was capable of processing 11,000 yards of material per day. The company has yet to determine why she sank. The Yuba #21, profiled in the June 2002 issue of ICMJ, was 500 feet long and worth $15 million. She had undergone 2 years of renovation and was ready to get back to work when she mysteriously sank. 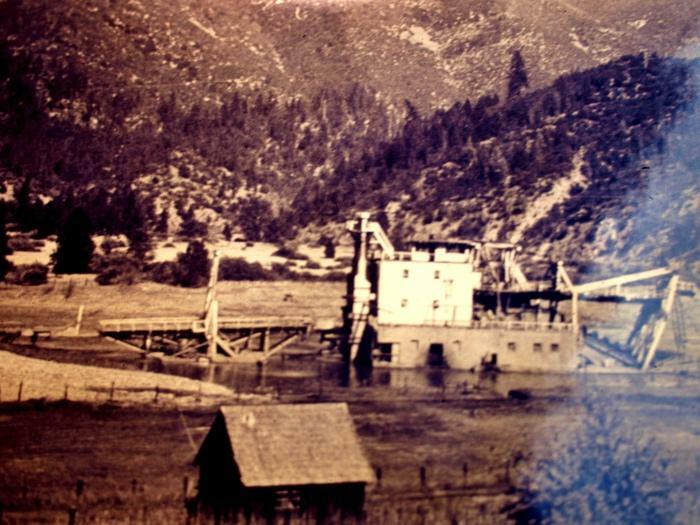 Cal Sierra Development general manager Tony Massey said the company recently purchased the Yuba #18, the only other similar dredge of comparable size that was built in the 1930s. 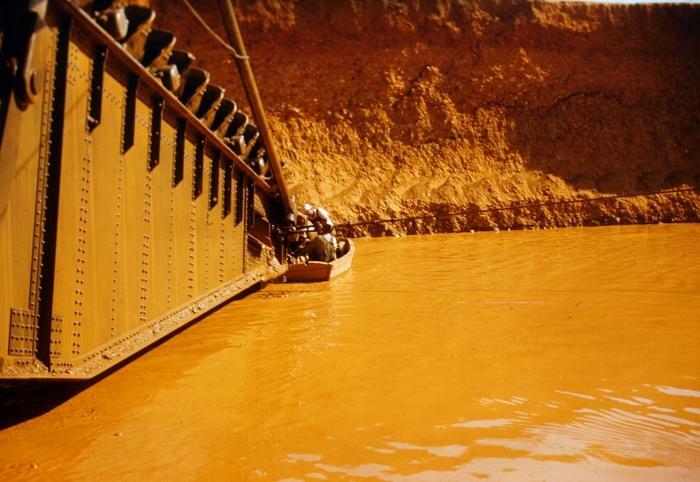 It will take a year for the company to receive the dredge, in parts, from its current location in Bolivia." The last one is labeled "Trinity Dredge Co., Mary E. Smith Manager, 1912-1940." Found some info on historicalmarkerproject.com that states "The Trinity Dredge, operated by Mary E. Smith, was the richest, dredging over $2,700,000 in gold from areas now covered by Lewiston Lake." 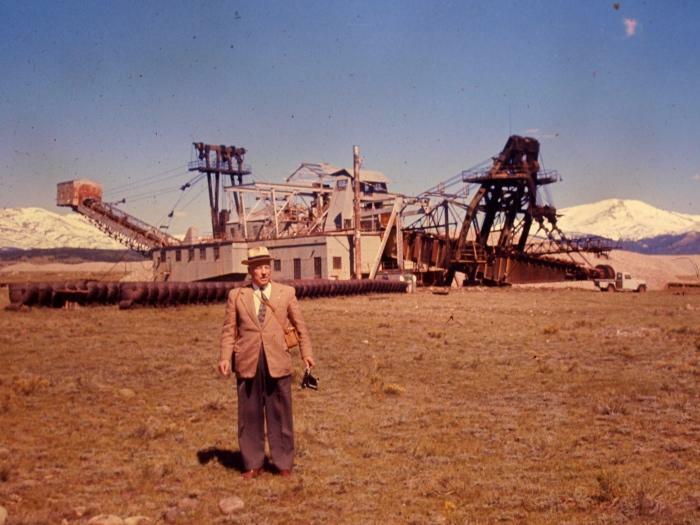 That's the Fairplay dredge delivered by Yuba Industries to the South Park Dredging Company just southeast of Fairplay Colorado in 1941. If you have ever been there you know how large that lower dredge field became. 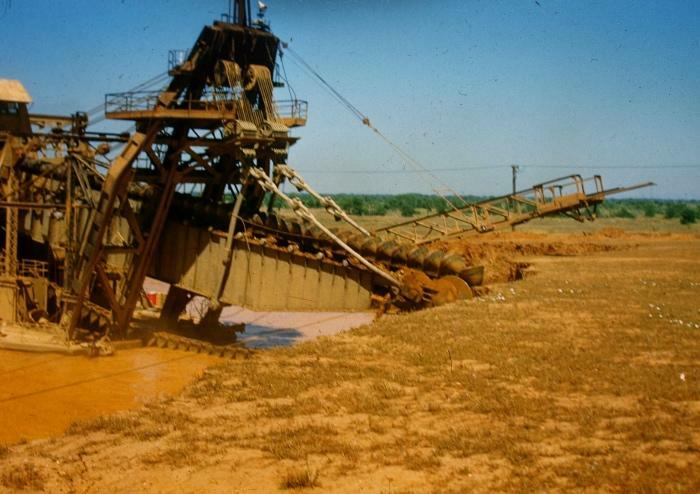 There were several smaller dredges running upstream of Fairplay, the best known being the much smaller Snowstorm dredge which is still mostly intact and in place except for it's long missing 12 yard walking dragline. 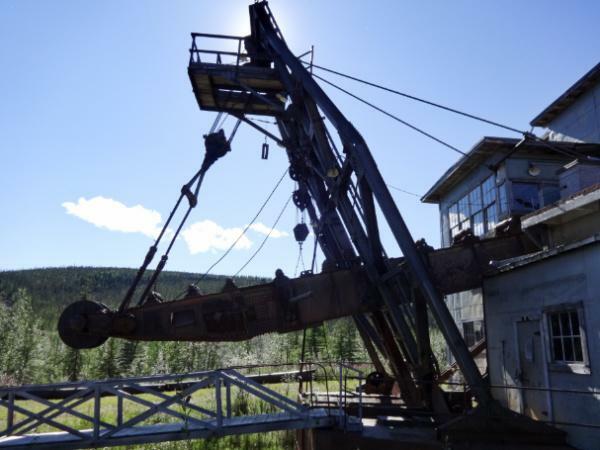 This is such a great thread on a fascinating part of mining history. Clay's encyclopedic mind is the perfect counterpart to IDdesertman's photo collection. This is the first thread I look at for new posts whenever I sign in.